Apple Piecaken, you ask? Friends, this is dessert deliciousness at it’s finest. It’s an entire apple pie baked inside a yellow cake. AN ENTIRE PIE. Its frosted with my Cinnamon Cool Whip Frosting to create a truly memorable dessert. Every year, I made five birthday cakes in three weeks during our family’s chaotic birthday season. Three of my four children, my husband and sister-in-law all celebrate birthdays and, of course, they all deserve their own special cake. After two versions of my Chocolate Pudding Fudge Cake – one with Dark Chocolate Buttercream, one with the traditional variety – a Nutella cake and rainbow cupcakes, I declared that this Apple Piecaken was my favorite of them all! Apple Piecaken, you ask? Friends, this is dessert deliciousness at it’s finest. It’s an entire apple pie baked inside a yellow cake. AN ENTIRE PIE. For my husband that lists apple pie as his numero uno favorite dessert, this recipe is the perfect collision of sweets. 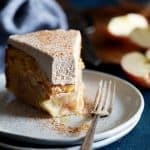 As much as I love a slice of apple pie, when it’s stuffed inside a buttery yellow cake and then topped with my Cinnamon Cool Whip Frosting, the result is nothing short of magical. Instead of frosting this cake traditionally, I instead to go with more of a “naked cake” approach. Basically, instead of thick layers of frosting, I went with a skim coat around the sides and a bit thicker on top. So easy! 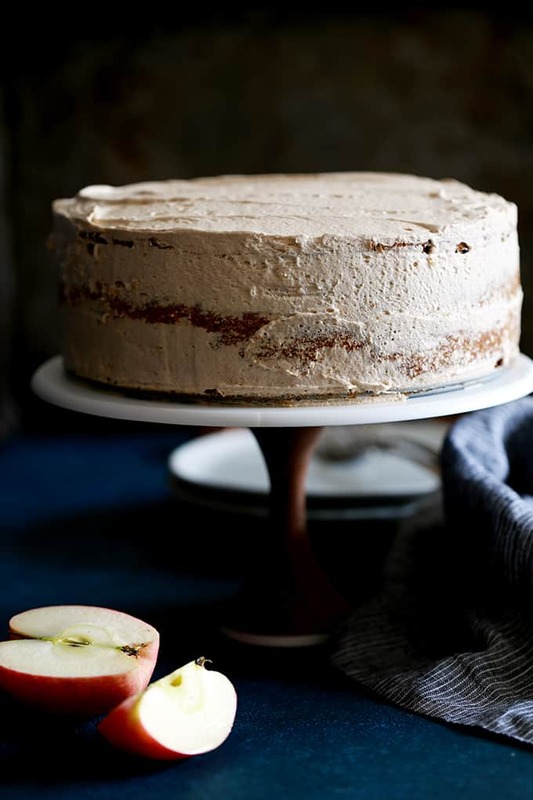 While this Apple Piecaken might look unassuming upon first glance, a complete surprise awaits once you cut the first slice. And that’s exactly what happened when I served the first slice of this Apple Piecaken to the birthday guy. 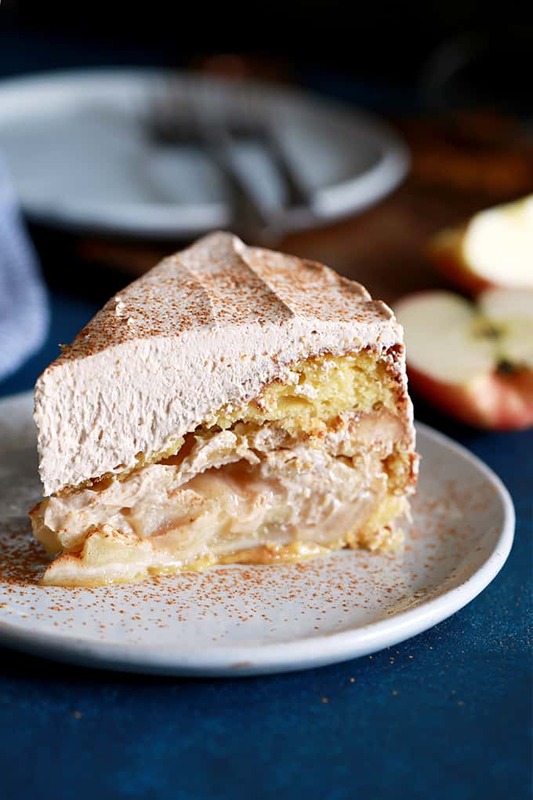 The layers of yellow cake, apple pie, more yellow cake and Cinnamon Cool Whip Frosting make for one showstopper of a dessert. No one will ever guess that it takes less than 10 minutes to prepare thanks to a boxed cake mix and store bought apple pie. You simply prepare the cake batter and pour two cups of it into a springform pan, plop the pie on top and cover with the remaining batter. So incredibly easy, so insanely delicious. Pour two cups of cake batter into greased 9" springform pan. Place prepared apple pie into springform pan and cover with remaining cake batter. Bake for one hour and allow cake to completely cool before removing from pan. Before serving, frost with Cinnamon Cool Whip Frosting. 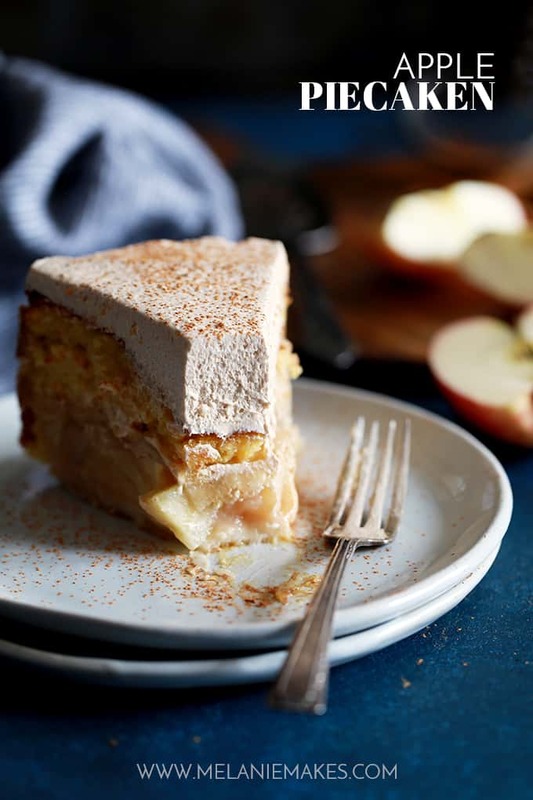 Can’t get enough of apple pie desserts? You’ll definitely want to give this Apple Pie Fudge, Apple Pie Bombs ala Mode and Stuffed Crust Skillet Apple Pie a try! Don't limit yourself... Lemon cake with blueberry pie is awsome and chocolate cake with cherry pie is the best. Thanks, Darla - I actually have a Black Forest version on my site as well! 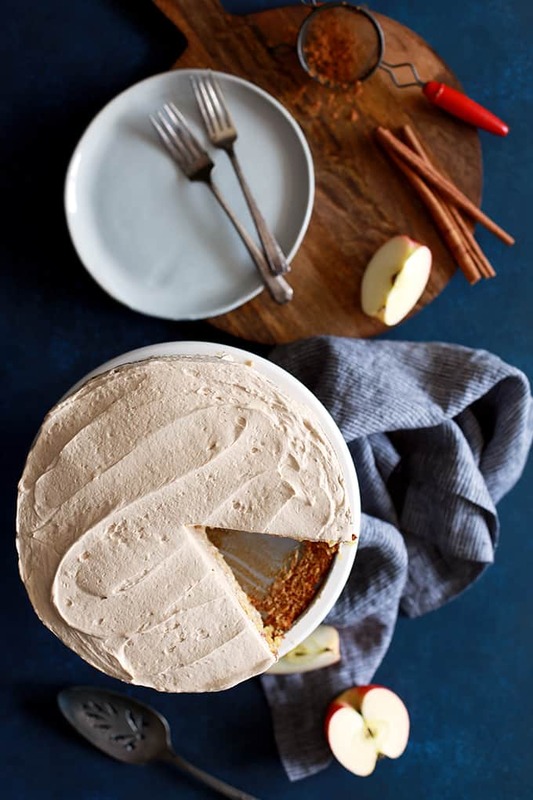 Just to clarify You buy a pre-baked store bought pie and remove from the container and slide it onto the batter?Don’t the apples get really overdone since it bakes an hour?My son is anxious for me to try this but I want to do it correctly.is there another type of frosting that would work as well? That's exactly what you do, Marilyn! The apples are within the pie crust and the cake so they're absolutely perfect. I'm sure you could try another frosting, but the Cinnamon Cool Whip is my favorite for this. What a fun idea! This looks so amazing! Holy cow I've got to try this. Looks incredible. It's a definite must make! This is amazing! I have to try this. Thank you for the recipe. OMG! This is genius! Apple Pie Cake is a fabulous idea! A must try! OMG this is seriously so unique! I love it! Can you frost it the day before serving and store it in the refrigerator until you're ready to serve? My son-in-law is going to love this cake! Hey, Suzanne - I've had leftovers the next day and it was fine but honestly, making it the day of would be the best option. It's so easy that it really takes no time at all! woah. this is mouth watering! i need it now! The best of both worlds, indeed! this looks amazing! Is the pie already baked before adding to the cake batter? I imagine it must be. Thank you, Cant wait to try this. Hey, Angela - Yes! The pie is already prepared and baked. Can't wait to hear what you think! Ohmygosh what a FUN idea! I'm in love!!! Do you just put the whole pie in, crust and all? This cake sure looks tasty! I love when two desserts are combined, and this is just perfection!! 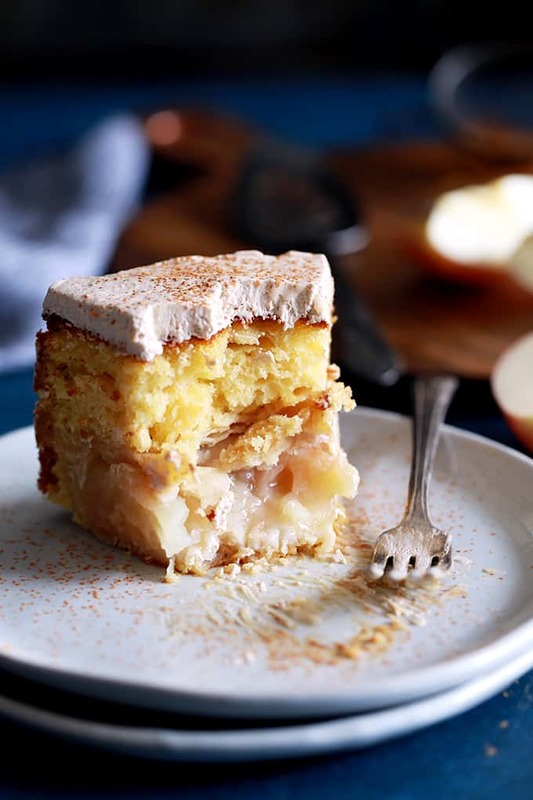 This looks like a fun and new way to enjoy apple pie/cake! Always fun to try new desserts! Wow, my boys are going to love this! I love that it's so easy! This is going to be such a fun dessert to bring out at our next dinner party! Everyone is going to be fighting over the last piece!